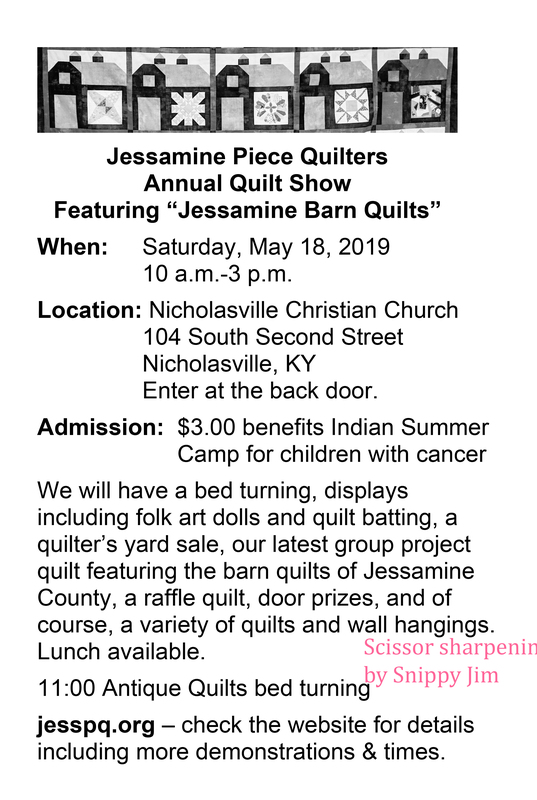 The 2019 Jessamine Piece Quilter Annual Quilt Show Featuring “Jessamine Barn Quilts” is scheduled for Saturday May 18, 2019, at Nicholasville Christian Church, 204 South Second Street, Nicholasville KY. Enter at the back door (follow the signs). 10:00 am – 3:00 pm. Lunch is available. We will have demonstrations, a quilter’s yard sale, our latest group project quilt (“Jessamine Barn Quilts”), a vintage raffle quilt, and of course, a variety of quilts and wall hangings on display. And door prizes!! Other demonstrations and presentations, times to be announced…. There will also be information about the Barn Quilts of Jessamine County, featured in our latest group project quilt. Snippy Jim can sharpen scissors. Bring your scissors, knives, or garden tools and let Snippy Jim sharpen them while you browse the quilt show. The 2018 Jessamine Piece Quilter Annual Quilt Show Featuring “Totally Tulips” is scheduled for Saturday May 19, 2018, at Nicholasville Christian Church, 204 South Second Street, Nicholasville KY. Enter at the back door (follow the signs). 10:00 am – 3:00 pm. We will have demonstrations, a quilter’s yard sale, our latest opportunity quilt (“Totally Tulips”), and of course, a variety of quilts and wall hangings on display. There will also be information about the Barn Quilts of Jessamine County. All times are approximate and are subject to change. We’ll do our best to stick to this, however. 2018 Raffle Quilt tickets are now available! The drawing for this opportunity quilt will be in early November 2018. Tickets for an opportunity to obtain this quilt are $1 each. Purchase from any Jessamine Piece Quilters member, or at our annual Quilt Show on May 19. 2018 Raffle quilt construction begins! Our 2018 raffle or “opportunity” quilt construction begins. The pattern is “Totally Tulips” with fabric from Tula Pink. We will begin to sell tickets at Quilters Day out on Saturday May 17. The winner of our 2017 raffle quilt was finally drawn on January ?? 2018. It’s Carol Dziubakowski of Georgetown. She bought her winning ticket at the Quilters Day out in March 2017! Carol visited the Jessamine Piece Quilters on February ?? 2018 to claim her prize! Thanks for supporting Jessamine Piece Quilters and supporting sending kids with cancer to summer camp! 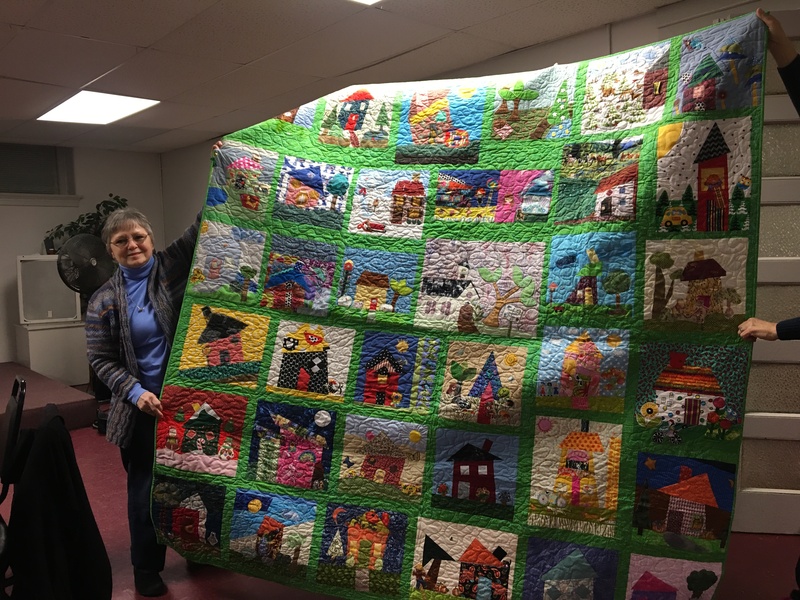 In November we delivered some of the charity quilts we’ve been working on for Kidz Place, a daycare center for medically fragile children. The faces are blurred for privacy, but take our word for it, there were some big smiles! So much fun to see the quilts loved by little hands! The Jessamine Piece Quilters held the first “Quilting Basics” class at the Jessamine public library today ( Nov 6, 2017). Nancy Cann shows the basics of “pressing” not “ironing” !! The library provided pizza for lunch Judy Brumfield, Elaine Leasor, Nancy Cann, and Peggy Rowe relax before the students started on quilting and binding their projects after lunch. Completed project!! Anna (second from left) was a motivated student to complete her quilted table runner today – she’s two weeks from her baby’s due date and has a 5 year old at home!! She did it!